Announcing "🏆Ultimate SuperHero Battle🤼‍♀": A Tournament Style Deathmatch Between Fiction Super Heroes! and win BIG REWARD. Is your tender, unassuming body ready for the event of the century? Enter the ruthless, brutal world of Ultimate SuperHero Battle! Every day, two familiar Superheroes commonly found in fiction stories and movies will be pit against each other in a fight to the death! Which will emerge victorious? Vote for which SuperHero you want to win by commenting on the comment sections, and write a brief explanation of why you think it would emerge victorious for better fun. The decision will be made based on the crowd favorite, balanced against the quality of the reasoning given in support of one or the other combatant's victory. The rules are simple. Two Heroes enter, one Hero leaves. As I said before the decision will be made based on the crowd favorite, balanced against the quality of the reasoning given in support of one or the other combatant's victory. If there is no crowd vote on that the winner will be announced as my favorite. There are 32 SuperHeroes combating in this battle with there own specialties and superpower. 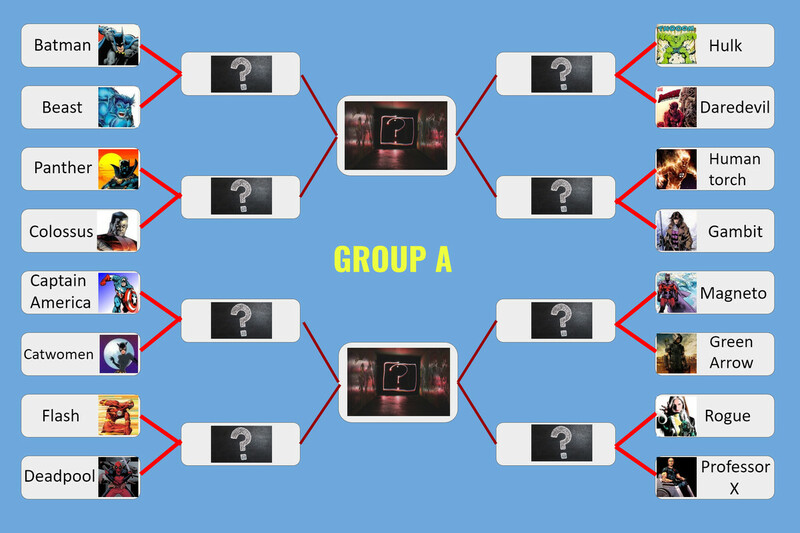 I made two groups GROUP-A and GROUP-B with 16 contestant in each. The Grand Finale will be in between the winner of Group-A and Group-B. The battle will start from tomorrow. Each day I'll make a post about the battle with two contestant as per the fixtures. All you have to do is just comment your winner under the daily post. I'll give upvote for the participant everyday. Wanna get more make the comment fun with the reason behind your selection. When the dust and blood settle, there will be only one remaining survivor, crowned the Grand Champion of Ultimate SuperHero Battle. It begins tomorrow, so pick your favorite combatant now and begin devising strategies! Comment your favorite combatant under this post, if your combatant is the final survivor of this Ultimate SuperHero Battle, expect a BIG REWARD in BEARS from @letsgheek. If there is more than one predictor then the reward will be equally shared with them. To enter the BIG REWARD pool, you should "Reshare" and "Upvote" this post before the first round of Group-A ends. I care a lot about what my followers and the Bearshares community at large think -- so feel free to leave a comment! Please read my Witness Thread and support me by voting @letsgheek for witness. This is amazing. Considering the fact that I'm also a "fictional character" enthusiast and I've not even decided who makes better fictional movies between DC and MARVEL, I would definitely participate in this tournament. Well, right now, my favorite character would be superman. Reason is quite simple. Remove the fact that kryptonite is his only weakness, he's indestructible and cannot be killed. Plus he has the combined hero abilities of nearly every character on that list. Speed, strength, ability to fly, heat vision, x-ray vision and super hearing. And that's just, listing a few. I haven't talked about the fact that this guy can blow solid ice-wind from his mouth and can also survive in zero gravity without any equipment. I know superman is gonna win. It's just an announcement and entry post for the reward, from tomorrow onward the the battle begin. It's just a fun battle for the users to make them entertained. Tomorrow is the day of first match from Group-A between Batman and Beast. Funny battle @letsgheek, really this gonna entertain the beashares. My hero is Wolverine. Unfortunately in group-B. An iron man side is deemed the winner even before the battle starts.